This species is accepted, and its native range is Tanzania to Swaziland. Stems spreading to 1–1.5 m. long, essentially glabrous; lateral branches mostly rather short. Leaves mostly opposite; petiole 4–10 mm. long; lamina coriaceous, green to slightly glaucous, mostly ovate-elliptic to obovate-elliptic, less often lanceolate, 2–8 cm. long, (0.5–)1–4 cm. wide, generally obtuse to shortly rounded at the apex, cuneate to shortly rounded at the base, with 4–6 pairs of lateral nerves, the lower ones strongly ascending. Umbels in axils and at older nodes, 2–4-flowered; peduncle 1–3 mm. long; pedicels 0–3 mm. long; bract saucer-shaped, with a small triangular limb, 1.5–2 mm. long, occasionally slightly glandular-papillate. Receptacle obconic, 1–1.5 mm. long. Calyx saucer-shaped, 1–1.5 mm. long. Corolla-tube 2.7–3.2 cm. long, dull red, generally with whitish spots, head of buds green turning greyish black particularly along angles; bud-heads oblong to oblong-obovoid, rounded to subtruncate, 4 mm. long, 2–3 mm. in diameter, angled or narrowly winged; basal swelling variously ellipsoid-obovoid to obovoid or depressed globose, 4–5 mm. long, 3–5 mm. in diameter, the tube constricted for 2–4 mm. above; lobes 7–9 mm. long, reflexed, the upper expanded part 4 mm. long, 1.5–2 mm. wide. Stamens green to red; tooth 0.5–0.7 mm. long; anthers 2–3 mm. long. Style with a neck 2–3 mm. long; stigma capitate, 0.7–0.8 mm. across. Berry not seen, said to be orange. 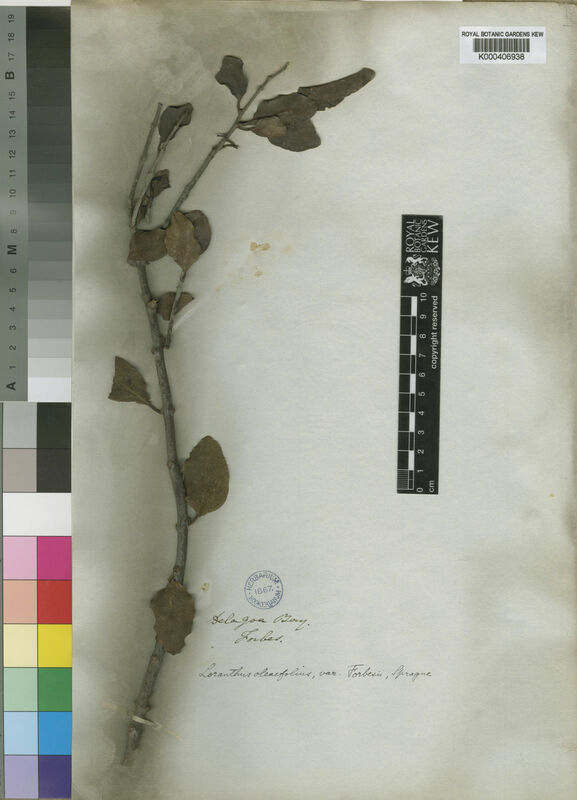 Deciduous bushland or thicket; ± 200 m.
Lectotype selected by Wiens (1978), Mozambique, Maputo, Delagoa Bay, Forbes s.n. (K, lectotype). Leaves mostly opposite; petiole 4–10 mm long; lamina coriaceous, green to slightly glaucous, 2–8 × (0.5)1–4 cm, mostly ovate-elliptic to obovate-elliptic, less often lanceolate, generally obtuse to shortly rounded at apex, cuneate to shortly rounded at base, with 4–6 pairs of lateral nerves, the lower ones strongly ascending Leaves mostly opposite; petiole 4–10 mm long; lamina coriaceous, green to slightly glaucous, 2–8 × (0.5)1–4 cm, mostly ovate-elliptic to obovate-elliptic, less often lanceolate, generally obtuse to shortly rounded at apex, cuneate to shortly rounded at base, with 4–6 pairs of lateral nerves, the lower ones strongly ascending. Umbels in axils and at older nodes, 2–4-flowered; peduncle 1–3 mm long; pedicels 0–3 mm long; bract 1.5–2 mm long, saucer-shaped, with a small triangular limb, occasionally slightly glandular-papillate Umbels in axils and at older nodes, 2–4-flowered; peduncle 1–3 mm long; pedicels 0–3 mm long; bract 1.5–2 mm long, saucer-shaped, with a small triangular limb, occasionally slightly glandular-papillate. Receptacle 1–1.5 mm; calyx 1–1.5 mm, saucer-shaped Receptacle 1–1.5 mm. Mainly in dry mixed woodland and coastal bushland, occasionally in miombo and mopane, up to 1150 m, on a wide variety of hosts, commonly Acacia, Combretum, Sterculia, with an aberrant form on Uapaca extending the range further into Malawi, Zambia and Katanga (Shaba) Province of Dem. Rep. Congo and up to 1750 m; flowering in most months, but most commonly in the dry season. Differs significantly from T. oleifolius in the lack of any conspicuous indumentum, apart from glandular papillae on the petiole and often the bracts. The species rarely grow together though their total ranges overlap widely. T. forbesii may also be confused with T. dependens, but easily distinguished by the short calyx. The populations growing on Uapaca are quite widely distributed, and somewhat coherent in their short peduncles and generally broad leaves. This element may be independently derived from T. dependens, but is not clearly distinguishable on current information. Mozambique Malawi Zimbabwe ZAM B, ZAM W, ZAM S, ZIM N, ZIM W, ZIM E, MAL N, MAL S, MOZ N, MOZ GI, MOZ M Zambia Also in Angola, Katanga (Shaba) Province of Dem. Rep. Congo, SE Tanzania and South Africa (Limpopo and Mpumalanga Provinces). Stems spreading to 1–1.5 m, essentially glabrous; lateral branches mostly rather short. Style with neck 2–3 mm long; stigma 0.7–0.8 mm across, capitate. Berry not seen, said to be orange. Berry not seen, said to be orange. Visser, S. Afr. Parasitic Fl. Pl. : 7 (photos. ), 143 (1981). Fl. Sthn. Africa 10, 1: 5, fig. 1/2b (1979). Polh. & Wiens, Mistletoes Afr. : 194, photo. 80, fig. 18B (1998). Visser, S. Afr. Parasitic Fl. Pl. : 143, t. 4–5 (1981). Wiens & Tölken in Flora of Southern Africa 10: 5, fig. 1/2 (1979). Wiens in Bothalia 12: 423 (1978).